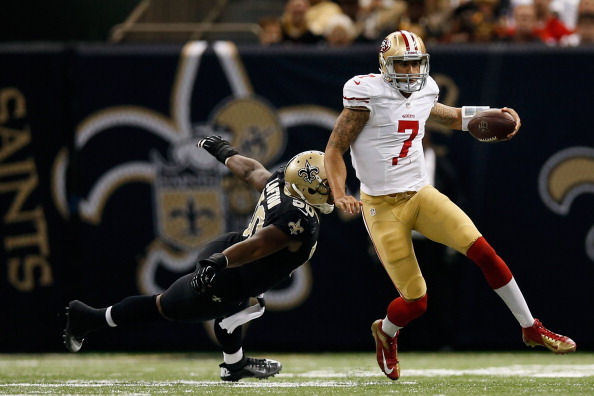 49ers starting QB Alex Smith was not inactive for Sunday’s game vs the Saints. Despite that, he still watched from the sideline, as backup Colin Kaepernick led the team to a huge 31-21 win over the Saints. Kaepernick threw for a touchdown and ran for another, while Ahmad Brooks and Donte Whitner each returned an interception for a score as the Niners pushed their mark to 8-2-1. The Niners backup QB went 16-of-25 passes for 231 yards with the touchdown and an interception in his second career start. 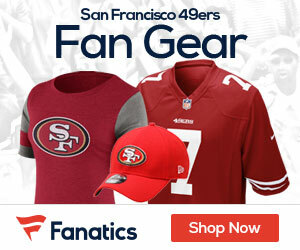 Smith suffered a concussion during the 49ers’ 24-24 tie against the Rams two weeks ago, and although Smith was cleared for contact earlier this week, Kaepernick remained the starter for San Francisco. Kaepernick finished with 27 yards and a touchdown on six carries and Frank Gore added 83 yards on 19 totes in the 49ers’ second straight win. Drew Brees threw for 267 yards, three touchdowns and two interceptions on 26- for-41 efficiency for the Saints (5-6), but was mainly kept in check by a 49ers defense that racked up five sacks. Marques Colston became the Saints’ all-time leader in touchdowns and finished with 36 yards and a score on four receptions as New Orleans had its three-game win streak snapped. The 49ers received the ball to start the second half with the game tied at 14-14, and Kaepernick converted a 3rd-and-2 with a 45-yard strike to Delanie Walker near the left sideline before Kendall Hunter’s 21-yard run set up a 6- yard touchdown grab by Gore. Then two plays into New Orleans’ ensuing drive, Whitner intercepted a high pass from Brees that tipped off the hands of a leaping Colston and took it 42 yards down the left sideline for a touchdown and a 28-14 lead with 11:30 left in the third quarter. The Saints responded with an 8-play, 80-yard scoring drive to get back within a touchdown as Lance Moore fought off a defender and hauled in a 43-yard reception to move the ball to the San Francisco 10, setting up Jed Collins’ 2- yard touchdown grab. San Francisco regained its two-possession advantage with a 16-play, 85-yard drive that stretched into the fourth quarter and ate up nearly 9 1/2 minutes of clock. Kaepernick converted three third downs through the air in the march, including a 3rd-and-11 at the 49ers 35-yard line, but the drive stalled inside the Saints 10 and San Francisco was forced to settle for David Akers’ 27-yard field goal for a 31-21 lead with 7:50 left in the game. That was enough to get the win, as the Niners D deserves a lot of credit for making sure Brees and company were held in check for most of the day while the offense did enough to get the win.